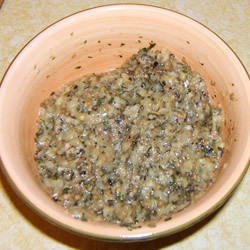 "Smooth broiled eggplant accented with chopped onion, olive oil, and dill. You can adjust the seasonings to your liking. Serve in a pita or as a dip for bread." 1. Preheat oven to broiler setting. 2. Wash eggplant thoroughly, then pierce skin with a fork in several places. Place on a baking sheet and broil in preheated oven for 8 to 10 minutes, until soft. Turn eggplant over and broil for an additional 8 to 10 minutes. Remove from oven and slice in half. 3. Scoop out eggplant pulp with a spoon and place in a medium bowl. Mix in onion, olive oil, dill, salt, and pepper. Serve hot or cold.